Addict Food + Coffee – Mushroom Delight! Addict Food and Coffee had been on my list since they opened earlier this year. Located in Fitzroy on Johnston Street, between Brunswick Street and Smith Street and right on the corner of Gore Street, Addict is owned by two couples – Greg and Brooke Brassil (who used to own a coffee roastery back in Shepparton) together with Joe and Brooke Ventura (who run the floor here at Addict). Ex-St Ali chef runs the kitchen – Steve Hogan – with barista Greg Brassil pumping out Clement and Market Lane coffee in both espresso and filter. Addict is medium in size is light filled and airy thanks to the windows that wrap around the corner positioning of the store. The décor is minimalist complemented with wooden tables that have black top, black chairs which can seat parties of two or four. There is also a communal table at the front for larger parties. Colourful flowers in jars together with pot plants hung up with macramé nets together with a sneeky picture that seems to have taken inspiration from the Gorillaz further add style and charisma to the venue. 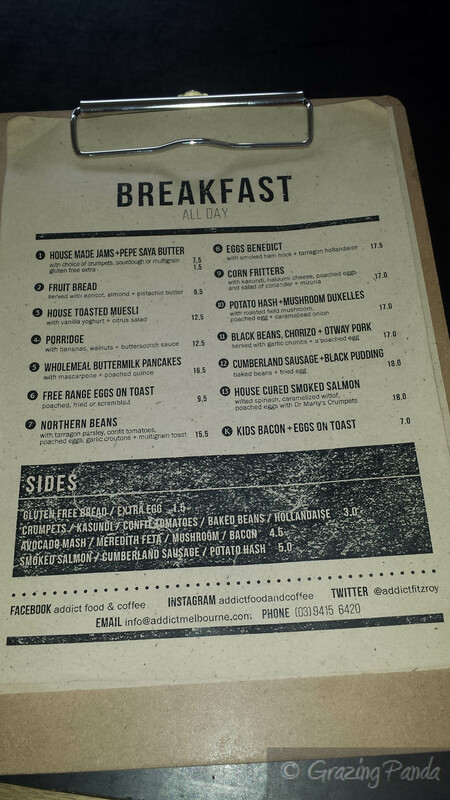 The menu created by Boyd not only includes regular breakfast dishes you would expect to see but also some intriguingly created dish combinations. 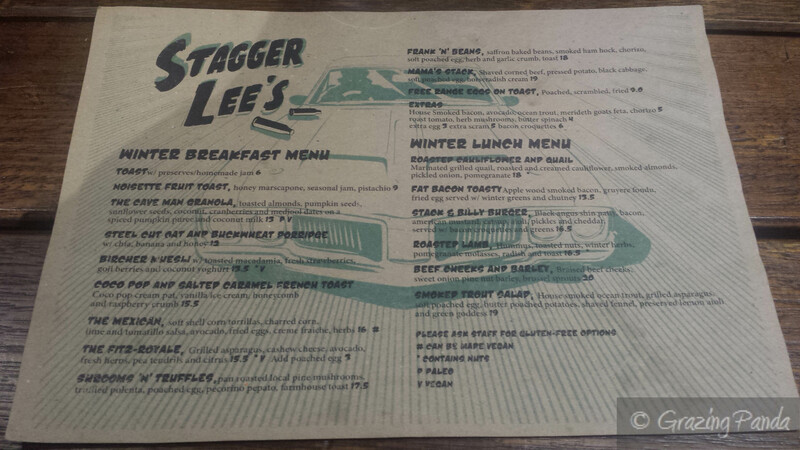 The breakfast menu runs all day together with a six dish lunch menu. Crumpets are supplied from Dr Marty, butter from Pepe Saya with Little Bertha supplying the delicious cakes, slices located at the front counter. The breakfast menu consists of dishes such as Wholemeal Buttermilk Pancakes served with a dollop of mascarpone and poached quince, Cumberland Sausage + Black Pudding, Northern Beans (with tarragon parsley, confit tomatoes, poached eggs, garlic croutons), House Cured Smoked Salmon and your usual breakkie dishes with a difference such as Eggs Benedict served with smoked Ham Hock + Tarragon Hollandaise, Porridge with Bananas, Walnuts + Butterscotch Sauce. The lunch menu covers all dietary bases with offerings of a Pulled Pork Burger, Chicken Breast with Kipfler Potatoes, Confit Duck, Salad of Quinoa & Roasted Root Vegetables and Olive Bread with Avocado, Baby Tomatoes, Basil Pesto, Haloumi Crumbs & a Poached Egg. 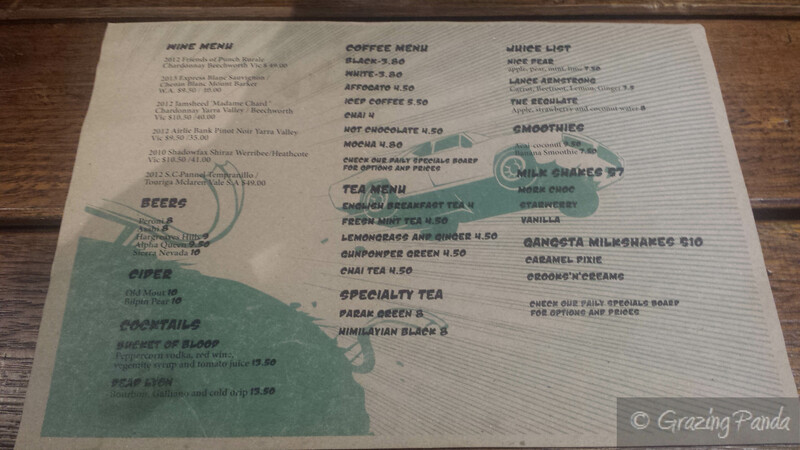 Aside from coffee you can find Mork Hot Chocolate, Prana Chai as well as a great selection of Teas and juices. Bonsoy and Almond Milk are also available. We arrived on a Saturday around 11am and the place was buzzing and quite packed – we were asked to put our name down for a table for two with a 10 -15 minute wait, however within 5 minutes we had a table. 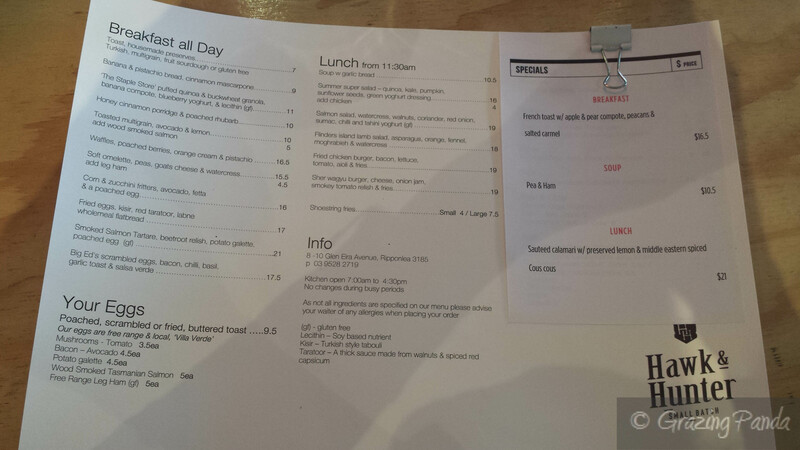 I ordered a latte to start whilst I decided what to order for breakfast and N ordered a long black. N’s long black came served with sparkling water – and he said it was perfectly flavoured and crisp. My latte was full bodied, rich and whilst no particular flavours stood out it was a well-rounded and balanced coffee. During my meal I also ordered a Prana Chai which comes served on a wooden board; with the chai in a silver pot to allow it to brew longer. You can then pour cup fulls yourself when you are satisfied with the length of time that it has been brewed. The chai was delicious – warm with just the right hint of spice added. Deciding on a breakfast dish was hard – I was tossing up between the Buttermilk Pancakes, Corn Fritters or the Potato Hash + Mushroom Duxelles. I decided to go with the Potato Hash + Mushroom Duxelles (with roasted field mushroom, poached egg + caramelized onion) due to my hankering for mushrooms that won over my sweet cravings. N ordered the Black Beans, Chorizo + Otway Pork served with garlic crumbs + a poached egg. My only complaint for the day would be that the wait time for food was a tad over the top – we waited around 50 minutes for our meals to arrive – and I had to ask twice how long our meals would be. I am not quite sure why it took so long for two dishes to come out, I mean there seemed to be turnover of patrons quite regularly and other dishes seemed to come out with a much shorter period of time – lost order perhaps? We weren’t really offered an explanation – but just an apology for the long wait. My dish was perfectly plated – the finely chopped and mixed garlic flavoured mushroom mash which provided a stable base for the crisp and deep fried deliciousness that was the potato hash on top, followed by a whole roasted field mushroom and finished off with a perfectly poached egg. It was not only art perfection but flavour perfection. The mix of earthiness and butteriness paired with the crunchy-on-the-outside-yet-soft-on –the-inside potatoes was divine. The caramelised onions added an element of richness and sweetness which rounded the dish brilliantly. A winner of a dish and a must try! N’s dish was presented well as well – with the stewed black beans and chorizo mix taking up most of the plate with a thick slice of Otway pork sitting on top and finished with a poached egg – garlic crumbs added an element of flavour and crunchy surprise. N said that his dish was luke warm and bordering on cold and that there wasn’t that many pieces of chorizo. Maybe it was their off day but this dish has the opportunity to be better. The staff here are quite friendly and really know their dishes when you ask them to explain a component you hadn’t heard of before. 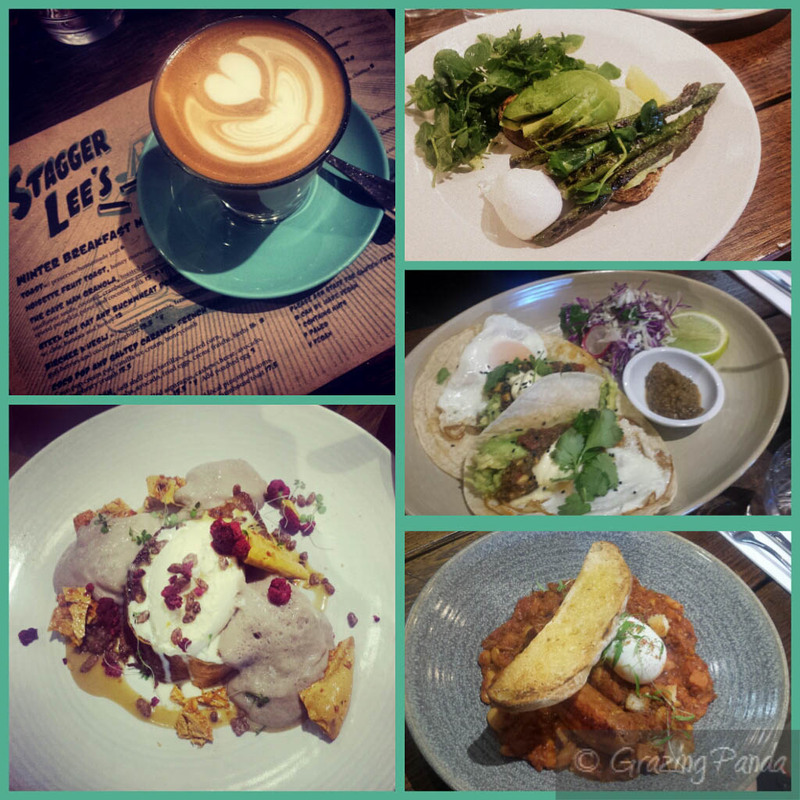 Dishes are beautifully presented with appealing dishes and the coffee is great on the palate. The place is warm, inviting and makes you relax. A pity about the wait time for our food – but hopefully many don’t encounter this – some would say the wait could be forgotten once you taste the dishes. Try it out for yourself. 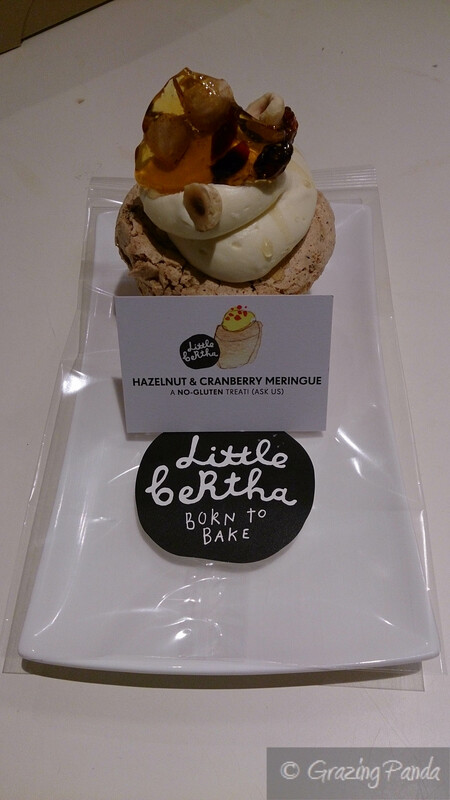 Little Bertha – Sweet Treat Heaven! 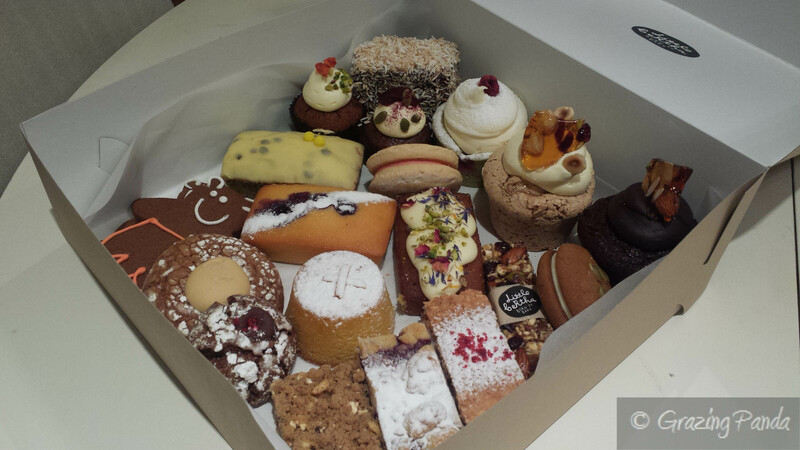 Little Bertha is a cake and boutique catering service that bakes fresh every day to order for a multitude of customers, that vary from a large number of cafes around Melbourne, corporate catering as well directly to you at home. Little Bertha was established in 2005 and is all about the local produce – using free range eggs from country Victoria (Healesville) mixed together with locally sources sugars, flours and premium quality ingredients. They also use real butter instead of margarine as well as no premixes or preservatives in all of their products. Another major plus point is that they offer products that are gluten-free. There is a huge variety of sweet treats to choose from – cakes, cupcakes, biscuits, slices, muffins – which can be delivered as individual portions, slabs or petit fours. If you refer to the Little Bertha website there is a convenient shop for both wholesalers and online shoppers with orders being delivered anywhere in and around Melbourne – be it to your front door at home, at your office workplace or even for corporate purposes. 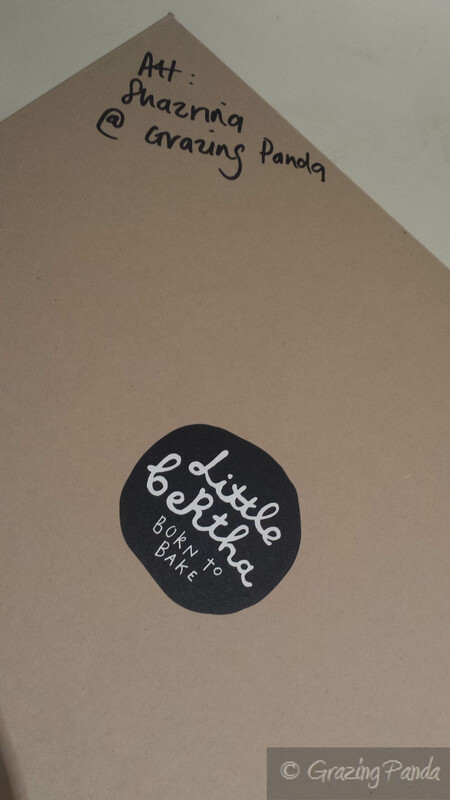 You have the option of also collecting your order directly from Little Berthas wholesale bakery kitchen in Abbotsford. 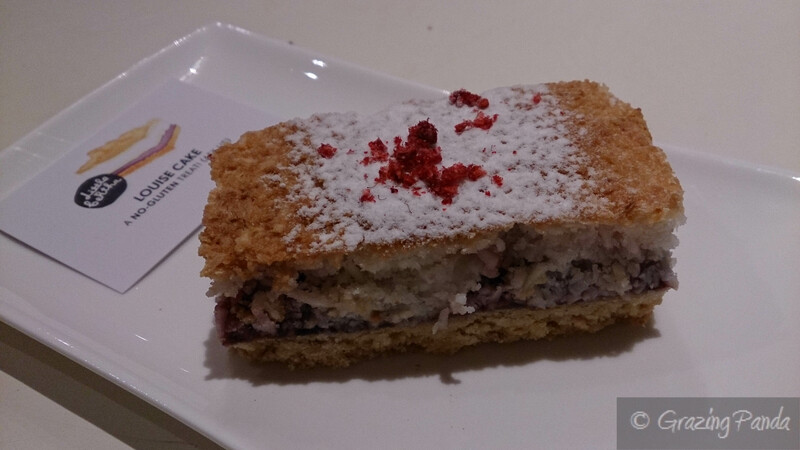 Across the road from where I used to work was a restaurant called Non Solo Posto (NSP for short) and whenever I was craving something sweet, I would make my way there and order the Pistachio & Raspberry Teacake – this became my favourite and most craved dessert. 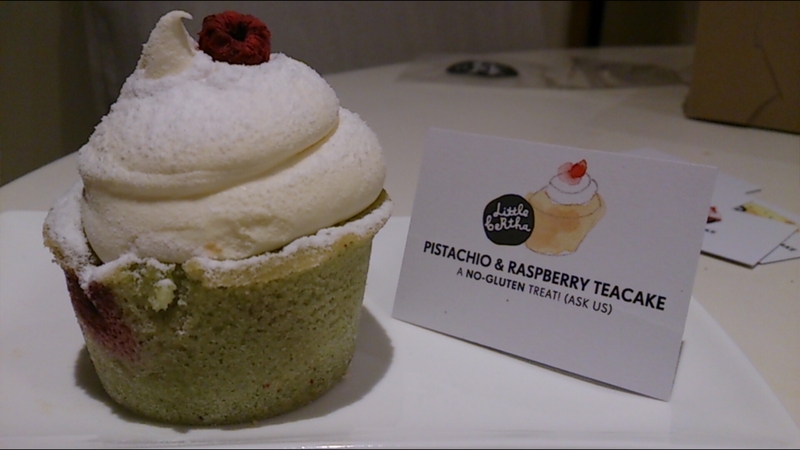 This heavenly cupcake was a combination of almond meal together with a rich pistachio flavour and laced with raspberries through the soft and cloud-like cake – topped with a very generous offering of white chocolate cream-cheese icing finished a single vibrant red raspberry. It is the most divine thing you will taste right up until the last bite. I try to eat half at a time – and save some for later in the day but that never worked as it just tastes too damn good! This was my introduction to Little Bertha cakes and I was hooked. It was to my great pleasure that I received an email from Little Bertha regarding a mention of their products on Grazing Panda and asking if I wouldn’t mind if they sent me a box of their sweet treats to try out some of their other products – who would say no to sampling of cute and delicious looking treats? Of course I didn’t mind! 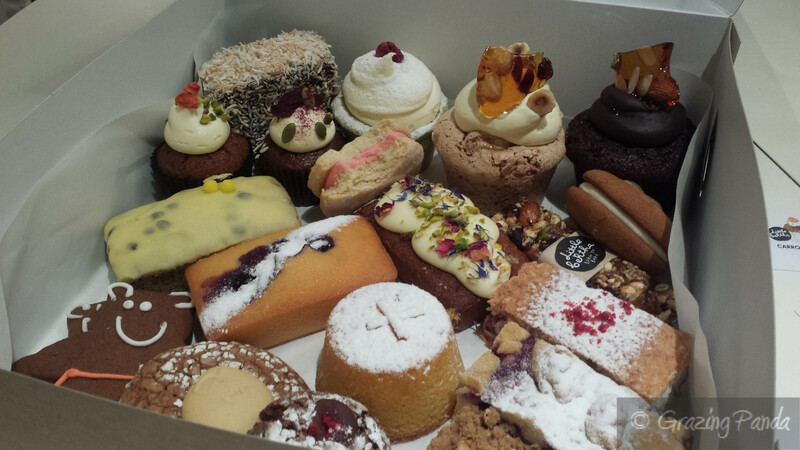 I was expecting a few of their sweet treats being delivered home but never expected a whole entire boxful to arrive – with over 20 treats to sample! It was a great colourful surprise. Below is a picture and a description of each of the cakes that I received. Along with the box of cakes that I received there were cute picture cards with the name of each item on them so I knew what each cake/slice/biscuit was – such a brilliant idea. The pictures on the cards done in a watercolour style – which I loved – represented and looked exactly like the real life item. A small sized cupcake made of shaved beetroot, cardamom and topped with icing and finished with toasted salted beetroot chips and pepitas. The cake was quite dense (as a result of being butterless) yet moist and had an interesting flavour – you wouldn’t have been able to tell that this was a beetroot cake unless you read that it was – it was subtle. I love the combination with the cream cheese icing and the combination of the crunch of the pepitas and the toasted salted beetroot chips – the saltiness was a great addition to the sweetness of the cake and icing. A larger sized cupcake that you would definitely mistake for a chocolate only cupcake – complete with chocolate icing and a golden almond praline. The cake is made with a combination of almond meal, freshly grated zucchini, cocoa and cinnamon. The combination of chocolate icing, cake and the crunch of the almond praline is magnificent. The standout is the almond praline – gooey, crunchy golden goodness! 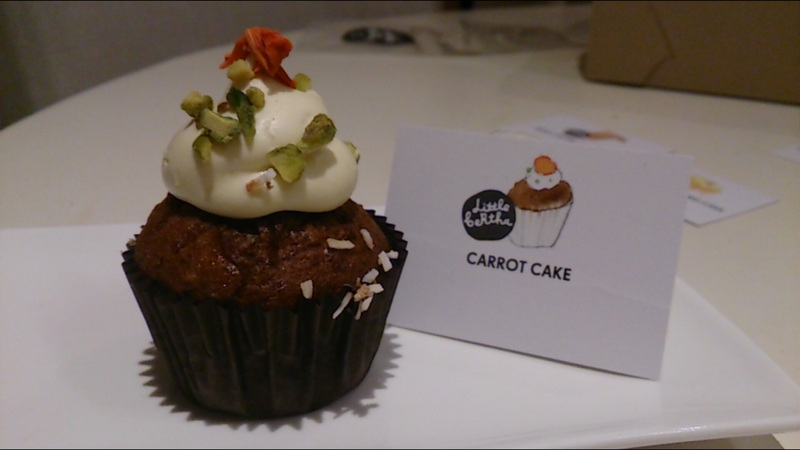 This was another of the smaller sized cupcakes which was topped with cream cheese icing and finished with pistachios and candied carrot. 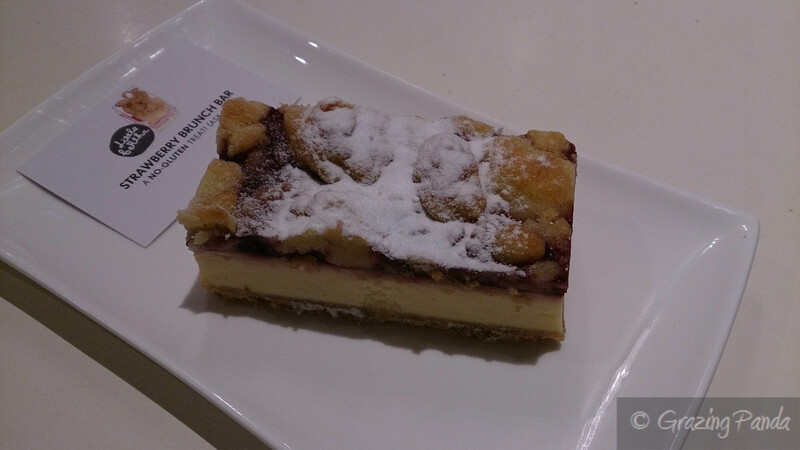 The cake had a mix of nuts which included walnuts and was soft, light and bursting with flavours. A really tasty version of a carrot cake. This is an impressive cupcake made of meringue and hazelnut meal topped with white chocolate cream cheese icing and finished with a beautiful glazed glistening hazelnut praline. I have never experienced a cupcake made of meringue and loved the idea of this – from the moment you bite into this cupcake you are in heaven – there is the initial crunch followed by the soft gentle taste of the meringue together with the burst of tang from the cranberries. Yum! The smoothness of the icing works well with this combination. This cake looks very pretty from the onset – it has pistachios and dried flowers on top of the yoghurt cream cheese icing. 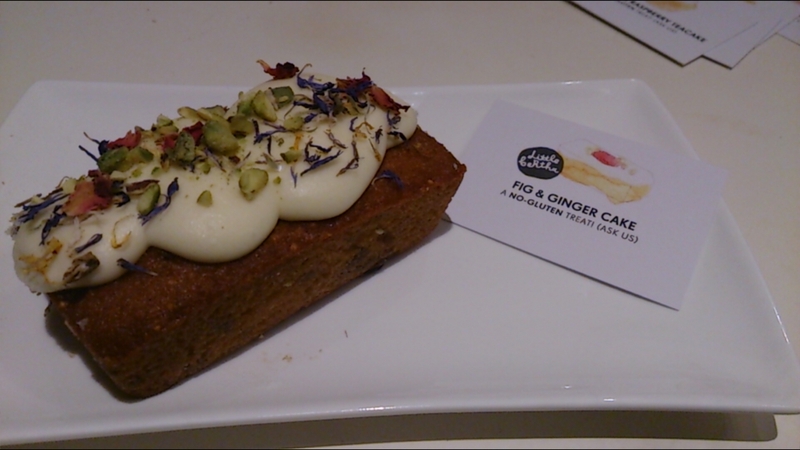 This cake is in a rectangular shape and is a soft flourless cake made with almond meal and flavoured with fig and ginger – a perfect combination. Such a tasty cake capped off with the tang and sweetness of the icing. One to try! 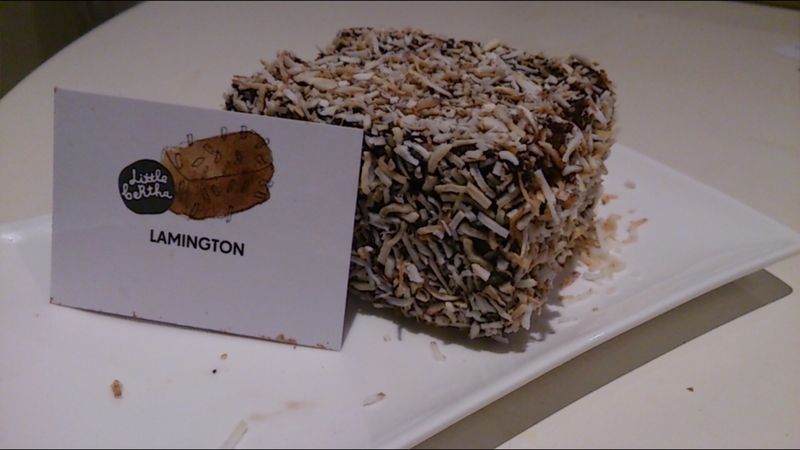 Everyone knows about lamingtons – buttery sponge filled with strawberry jam and coated in dark chocolate icing and finished by being rolled in toasted coconut. 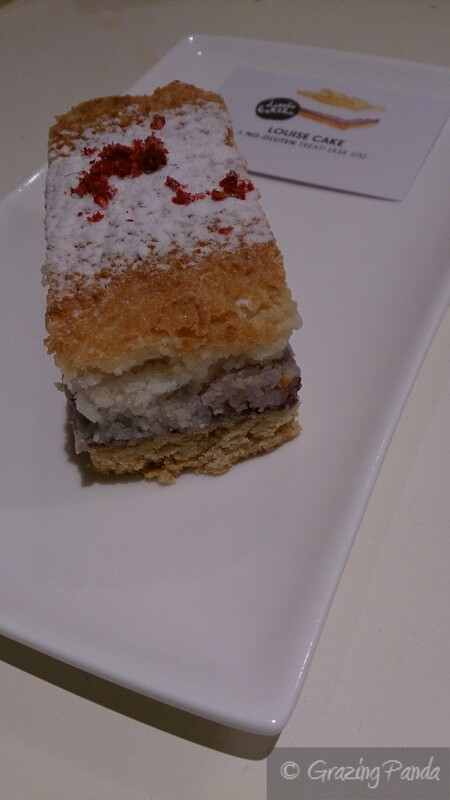 The Little Bertha lamington was cloud soft and literally disappeared in your mouth almost like fairy floss – divine! Another stand out cake with an exhilarating combination – lime and yoghurt! 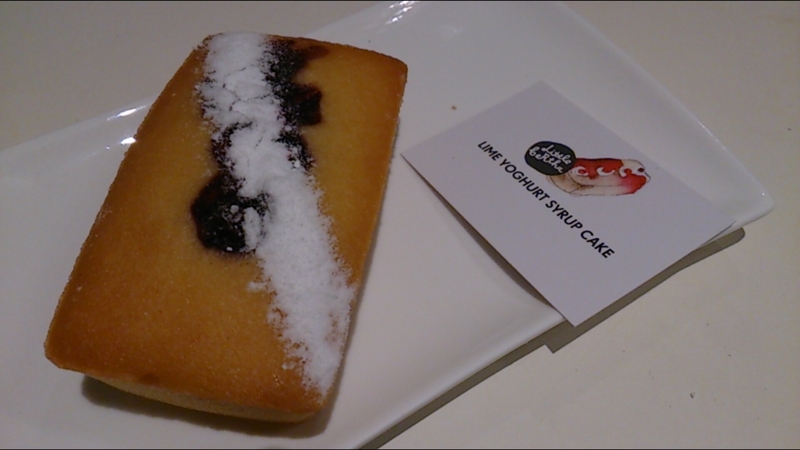 The tangy butter cake has had yoghurt folded through together with blueberries and finally dropped in lime syrup. The end result was a full on tangy flavour (people that enjoy the lime flavour to things would love this cake) however still made for quite a refreshing cake – the addition of the raspberry did compensate for the tang. This cake would have to be one of my favourites (*drool*) – a round golden, moist and overly delicious flourless cake made with fresh mandarins. I love the little texture bits that you get to bite through once you bite into this cake – thanks to the polenta and almond. 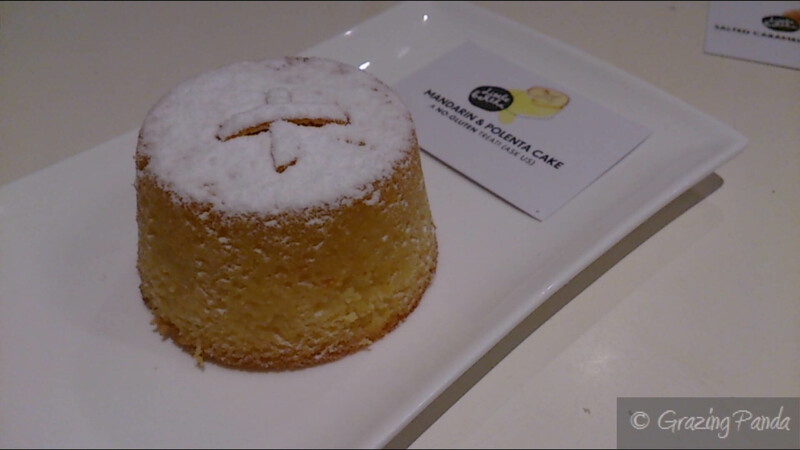 I am usually not a fan of citrus in my desserts or sweets but was pleasantly surprised when I tried this cake. Really great! This rectangular cake is made of poppy seeds and top with a zingy passionfruit icing and finished with two Mimosa sugared pearls. 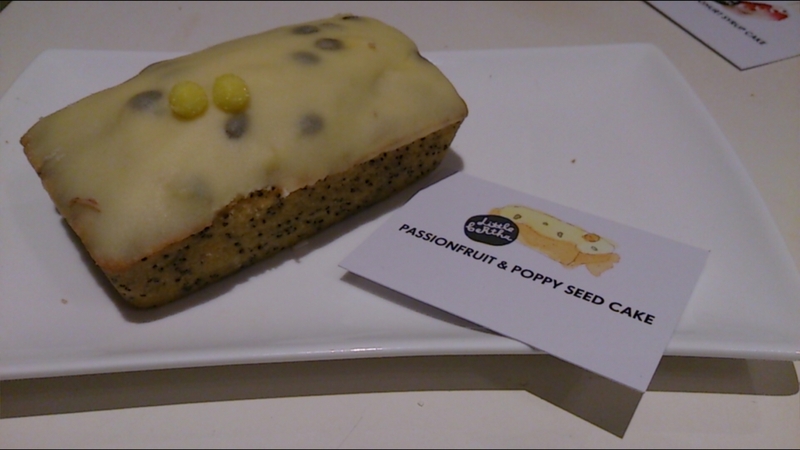 I found this cake to be a tad on the dry side with the poppy seeds providing an added crunch, however the flavours worked well together – the tang of the passionfruit was refreshing – which was needed to liven the poppy seed cake. 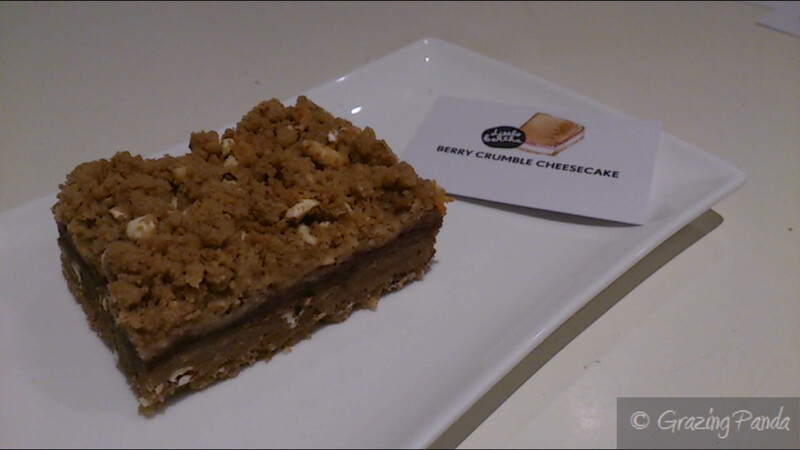 This cheesecake slice was highly intriguing and had a lot of flavours running through it – so it was a fun cake to try and decipher. 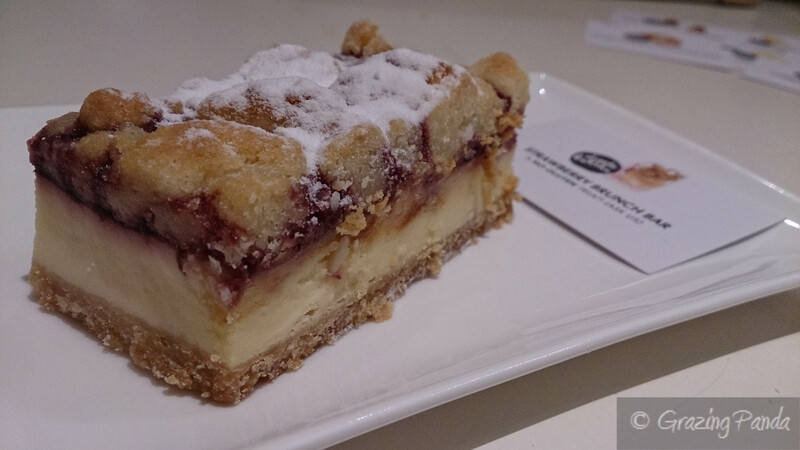 Made of blueberries, raspberries, blackberries together with cream cheese and sour cream on a biscuit base and garnished with a crumble top. Everything about this cake was delicious but my favourite would have to be the biscuit crumble on top – I could eat an entire bowl of this! 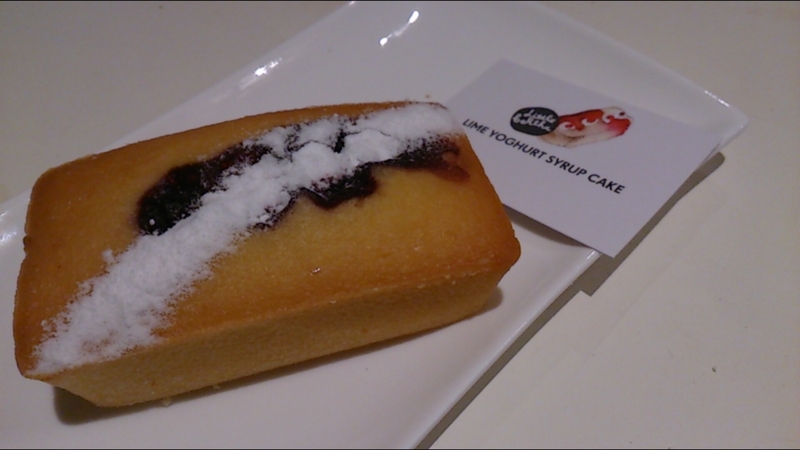 The combination of the berry tang and the crunch and smooth flavours of the biscuit was delicious. To me this isn’t really a cake but more so a slice – complete with a coconut shortbread base, followed by layers of a fruity berry filling with a crusty coconut meringue top and finished with icing sugar and freeze dried berries. When you take one bite and get a cross section of all the layers the combination of flavours do work well together – from the coconut, meringue, berries and punchy lemon hit. A great textured dessert. This strawberry brunch bar is another one of my favourites. 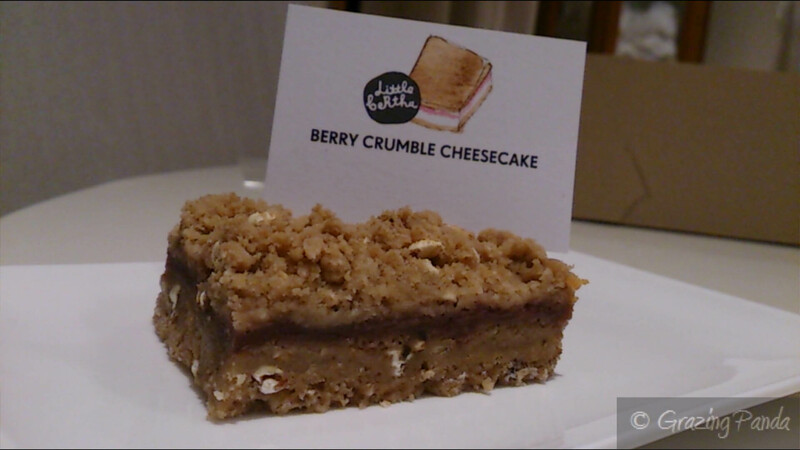 There is a biscuit base with a cream cheese centre layer that is topped with a strawberry filling and finished with a brown sugar and puffed cereal grain topping. When looking at this beauty – you would expect the top part to be crunchy, however it is soft and melts in your mouth. The strawberry is the hero of this slice as it adds a tanginess to the overall sweet taste. This is one of your healthier options complete with fresh nuts, seeds, dried fruits and puffed grains. Even though this looks mighty healthy it still has a very tasty and delicious flavour to it thanks to the combination of cranberries, coconut, apricot, pistachio, golden syrup, almonds, macadamias, hazelnuts and vanilla paste used. 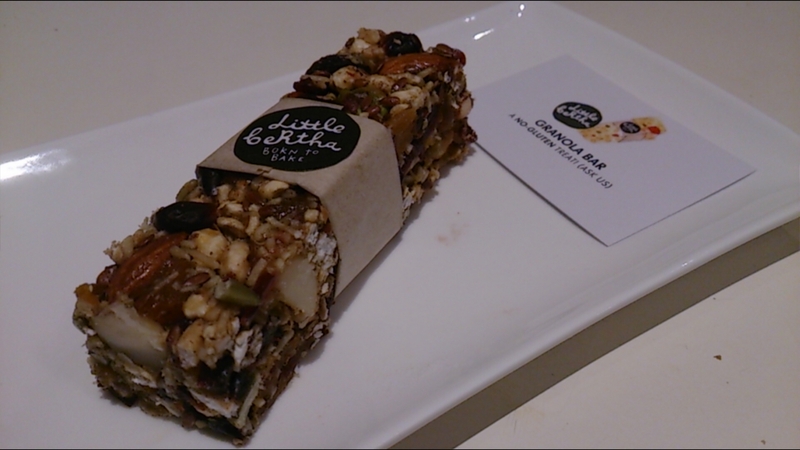 The bar was chewy and the textures altogether made for an enjoyable experience. 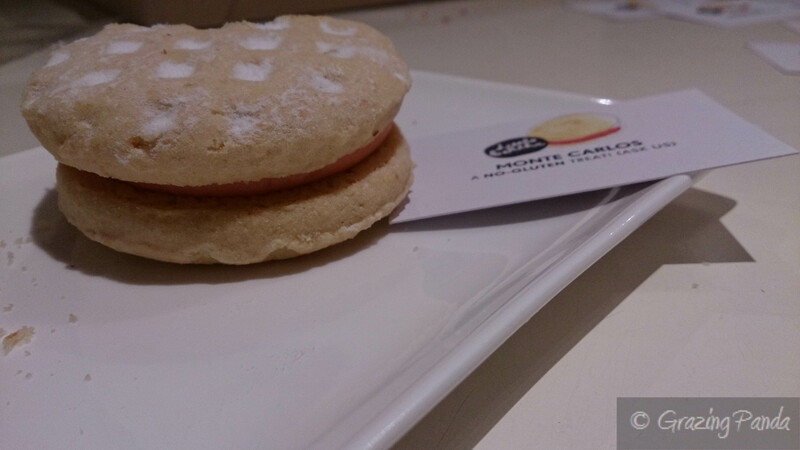 The Monte Carlos had a strawberry centre in between two soft and delicious short bread circles, which had been dusted with icing sugar. The combination of the buttery short bread that literally crumbled in your mouth with the not-too-sweet vibrant strawberry filling was brilliant! This Salted Caramel Chocolate Snap was another one of my favourites – the caramel centre was soft, sweet and gooey with rock salt placed on top to create the salted caramel effect. 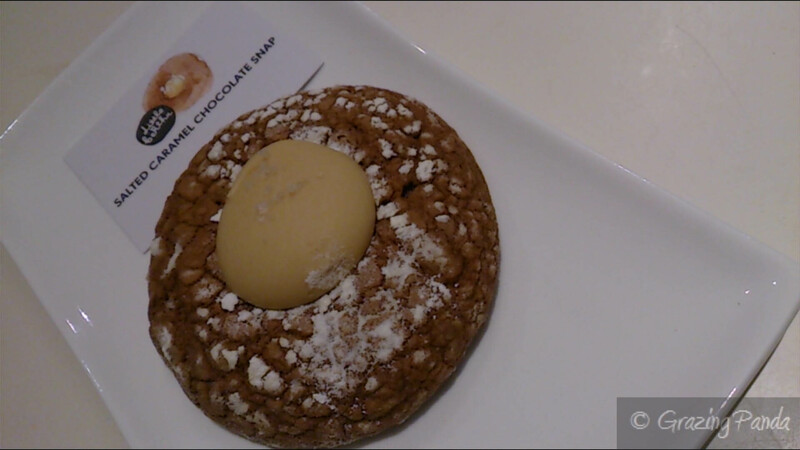 The biscuit itself made with brown sugar, dark chocolate, Dutch cocoa, pistachios, white chocolate and all spice was soft and malleable – which made it so easy to eat (more like gobble down!). It almost tasted like a spiced walnut biscuit. Try it for yourself! 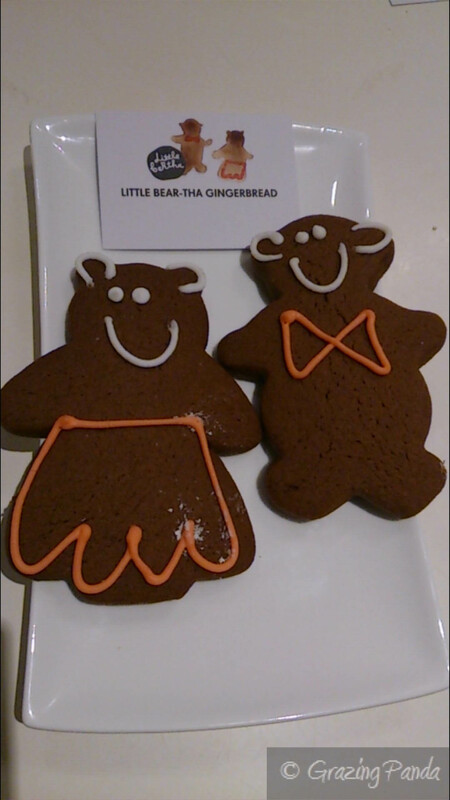 These gingerbread men / women biccies were adorable – almost too cute to eat! As they were gingerbread – you would almost expect a bit ginger flavour hit – however the ginger flavour was quite subtle which I liked. The biscuit itself was quite soft and overall it was an enjoyable bear treat to eat. 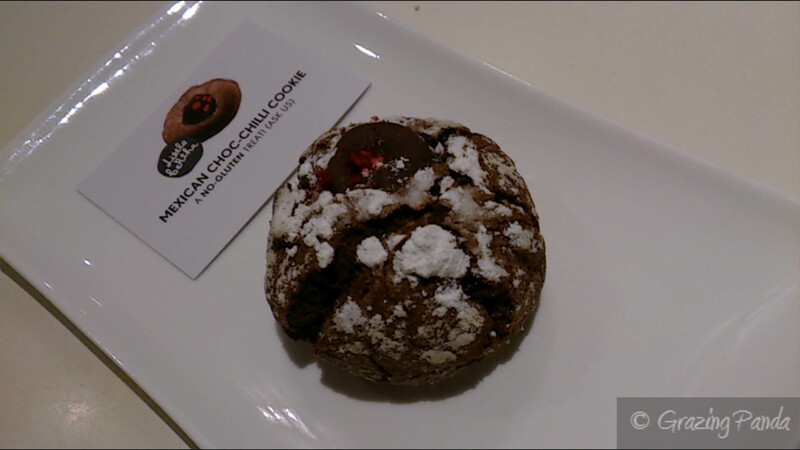 The Mexcican Choc-Chilli Cookie had a surprise in the centre – soft chocolate ganache – which would make anyone’s day. The biscuit reminded me of marzipan in a way and the chilli flavour hits you at the end of your mouthful which creates a fiery zing. The cookie is not overly sweet thanks to the addition of cinnamon and had some crunch due to the almonds. A fun tasting cookie. 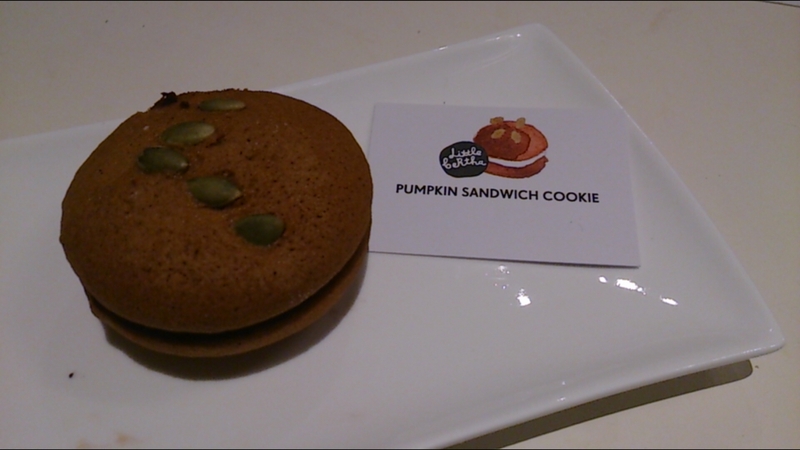 The Pumpkin Sandwich cookie is made with a combination of the pumpkin, brown sugar, cardamom, nutmeg, salt and vanilla paste and comes with a cream cheese centre topped with pumpkin seeds. From the first bite the flavours reminded me a lot of the gingerbread cookie. The cookie was soft with the added crunch from the pumpkin seed. I was a little disappointed as I was expecting more of the pumpkin flavour to shine through. 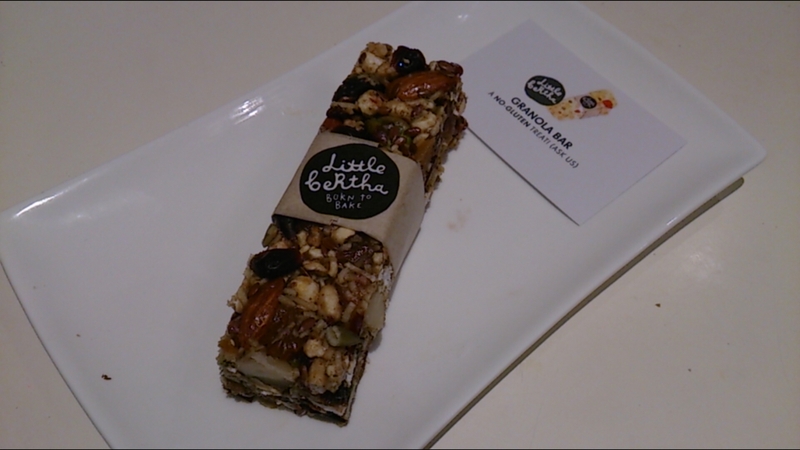 I would highly recommend anyone who enjoys a great tasting sweet treat or for that matter even people who aren’t big fans of sweet treats to check out Little Bertha for themselves – there really are options for everyone. They even cater for gluten free and vegan requirements. If you check out their website you can have a look at the very long list of cafes in and around Melbourne that stock their beautifully handcrafted products. Or even better – order a box delivered fresh straight to your front door! Hawk and Hunter – Ripponlea Gem! A and I were heading out on our usual brunch catch-ups and this time we were checking out Hawk and Hunter. We trekked down to the south east part of Melbourne – Ripponlea to be more specific – and after ordering enough for all three meals in a day, were happy with our decision to make the trek down. Hawk and Hunter comes courtesy of owners Ben Avramides, Tommy McIntosh, Luke Holt and Simon Winfield – who are also responsible for The Little Ox (located in Brighton and is on the list of places that I have yet to try), as well as catering company Tommy Collins. From the moment you step into Hawk and Hunter – you feel like you have been transported into another land – the interior is beautifully quirky and mismatched. There is a combination of wood, steel, neon mesh sculptures, artwork of old newspaper clippings, birdcages, ducks and a large cut up tree – but it all works amazingly well together. There are a plethora of tables at this large venue – with tables for groups, singles and couples. A and I had to wait about 5-10 minutes for our table (you will need to queue up on the weekends – this place is highly popular with the locals) – but this meant that we got to take in the atmosphere and also peruse the counter with its baked cookies. We already made a mental note that we wanted one of each on display – there was a cookies and cream brownie, two different varieties of pops, granola and white choc truffles, orange blossom meringues and macaroons just to name a few. What also caught my eye was their fridge filled with home made ice-cream with flavors such as Ferro Rocher and Mango. We were seated at the end of the communal table – which gave us a view into the kitchen and the dishes being prepared. We ordered coffees to start from our super friendly waiter – who was very keen to have chit chat. Always love great customer service! Coffee is from Red Star Coffee. I ordered a latte and it was quite tasty – smooth with plenty of fruity flavours and resulting in a crisp taste. A ordered a hot chocolate. 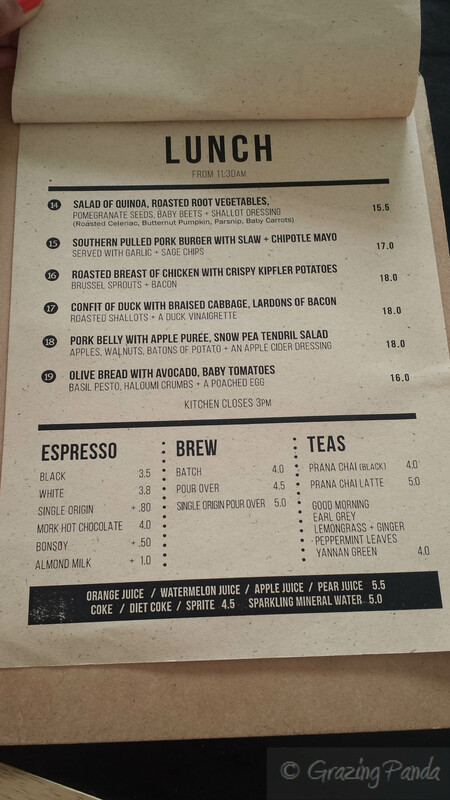 We also saw the fresh juices and decided to order them. It came in a jar and was a mix of orange, passion fruit and watermelon – a really refreshing and tasty combination. The menu consists of an all day breakfast menu which comprises a mix of sweet (there is banana bread, waffles) and savory dishes (scrambled eggs done in different ways, fritters, smoked salmon tartare) to choose from. There is also a lunch menu which is served from 11:30am onwards and includes a wagyu burger, chicken burger and a variety of salads. There are also daily specials for each category to choose from as well as a soup of the day. After much deliberation I decided on the Corn and Zucchini Fritters, Avocado, Fetta and a Poached Egg. I was tossing up between this dish, the Salmon Tartare, the waffles and the special French toast. A and I decided to share the French Toast so that made the decision a little easier. My corn and zucchini fritters were plated up well – the fritters at the base, with the avocado and poached egg placed on top, with the fetta, pomegranate molasses and chilli sprinkled around. The fritters were smooth and soft and filled with flavour. Paired with the fetta, avocado and a hint of chilli worked well. A ordered the Big Ed’s Scrambled Eggs, bacon, Chilli, Basil, Garlic Toast and Salsa Verde. The Scrambled eggs sure was a large and generous serving and A couldn’t finish it all. I did try some of the Garlic Toast – which wasn’t overpowering with garlic and was crunchy and buttery. The salsa verde was fresh and worked well I thought with the garlic toast. We ordered the French Toast with Apple and Pear Compote, Pecans and Salted Caramel to share and boy am I glad we decided to order this dish. The dish was quite generous in serving once again and was plated up on a long white oblong dish. It had an Eaton Mess style of plating up – with the taste just divine. The Apple and Pear had been poached perfectly and had the right amount of softness. The addition of the salted caramel together with the other sweet elements and the crunch and texture of the pecans worked well together. This dish was a special the day we went, but if it does appear when you visit – definitely try it out. Hawk and Hunter is a great place to try out for brunch – from the friendly staff to the very cool fit-out to the amazing array of sweets to try out, as well some home made ice cream to take home to remember the visit by. Well worth the travel I say! Atmosphere / Ambience: Quirky, Fun, Relaxed – great to spend hours chatting and enjoy the weekend! Light-filled and great for people with kiddies. Service: Fantastic – Friendly and Fun! Alice Nivens – Baked Goodness! Alice Nivens is tucked away in the Port Phillip Arcade and is known for its quirky Alice in Wonderland theme – just have a look at the colourful artwork which shows a picture of Alice and the White Rabbit. Alice Nivens is known for their baked goodies – and bake fresh every day! The sweets range from cupcakes to brownies to slices. On the day I visit there is a Rosewater and Strawberry whoopie pie, Alice’s caramel slice, Lemon and Pistachio Slice, Cake pops, muffins and home made muesli. For lunchtimes – there are also a range of sandwiches that can be made, with various toppings such as smoked chicken, turkey or the vegetarian option of roasted pumpkin, hummus and olives. 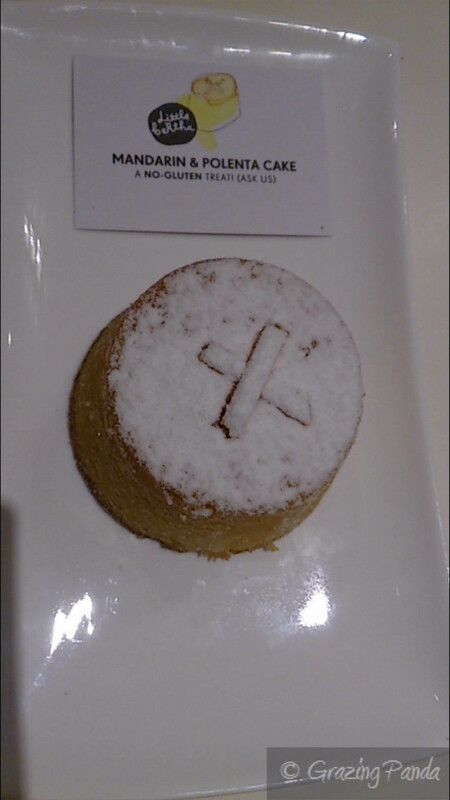 I couldn’t look past the chocolate brownie – sweetly topped icing sugar in the shape of a rabbit – tres cool! To go with this sweet treat – I ordered a latte. Coffee is from Small Batch and is truly delicious. The brownie was rich, intense and I loved the harder top layer. The combination of this layer with the smooth chocolate underneath was great. You can follow Alice Nivens on Instagram and Twitter (@AliceNivensCafe) to find out what their daily creations of sweet are! Natvia was founded after the realisation there was a gap in the market for a 100% natural sweetener. Founded in 2008 by Mark and Sam, and having gone through over 600 trials and 10 months of work they finally reached the perfect blend and taste combination. Natvia uses the very best parts of the Stevia plant, combined with naturally occurring nectar known as Erythritol. Stevia is a sweet leafed plant which is part of the Chrysanthemum family. Both Mark and Sam are passionate about the product and you can tell they really do care not only about the product but about the people as well. Some of their core values include educating people about the food and bringing love back to cooking, as well as trying to spark bit of a health revolution. Natvia has 97% fewer calories, contains no Aspartame or saccharin and has nothing artificial – it is all natural with no bitter aftertaste. The Natvia Icing sugar we were told took around 2 years to make and is a world first! The idea was that the sugar was milled down further which makes it easier to pipe with. Tasty and making life easier – what a great combination! Another plus point of Natvia is that it can be easily substituted in a 1:1 ratio with sugar. So there is no need for complicated calculations to try and convert measurements. Natvia can be currently be found in drinking mixes, tomato sauces and in the future thanks to their product innovation could be found in many more products to meet the growing market needs – so keep a lookout for their products. Natvia is available at Coles, Woolworths and Independent Groceries – IGA, Foodworks, Aussie Health, as well in many countries around the world! If you want copies of the Natvia Sugar Free Baking Recipe Book – feel free to contact me via email (thegrazingpanda@gmail.com) and I can email you a copy. I have PDF versions. I had the pleasure of being invited to a Cupcake Workshop by Natvia who worked in conjunction with Cupcake Central (stores in Melbourne Central, Hawthorn and Highpoint). 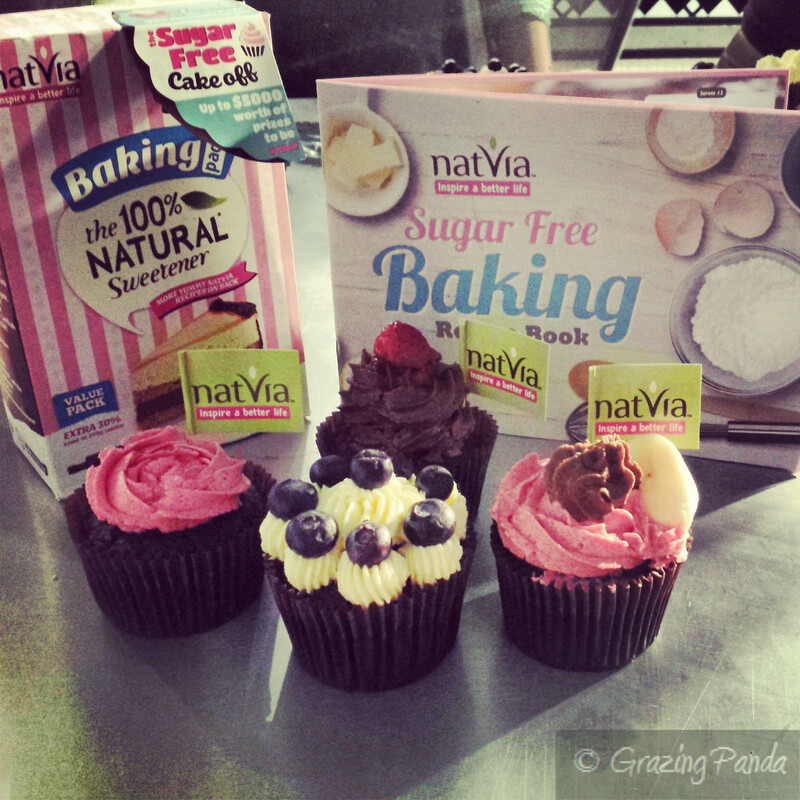 Cupcake Central now stocks sugar-free cupcakes as part of their range which of course has been sweetened by Natvia. I was greeted by a Natvia representative who welcomed me to the event, and handed me my very own Natvia apron, Natvia Sugar Free Baking Recipe Book and name tag. 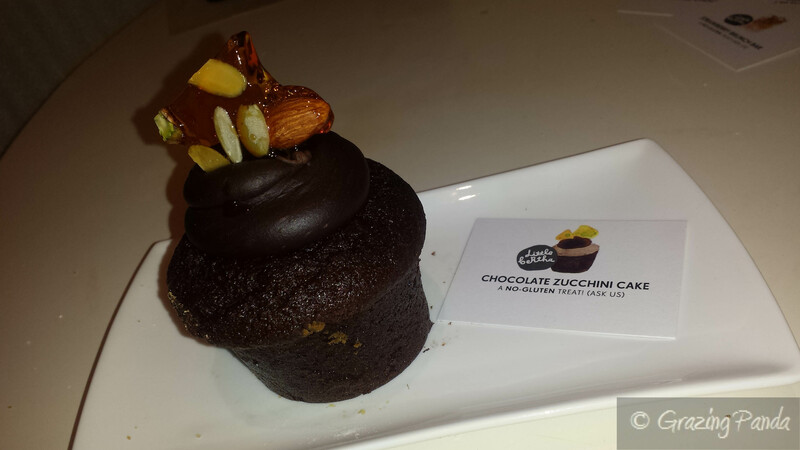 There were nibbles and drinks provided, as well Bar-Narnie cupcakes from Cupcake Central. These cupcakes were protein packed and gluten free as well as being sugar-free and actually tasted really good! Healthy and tasty what more could you ask for! 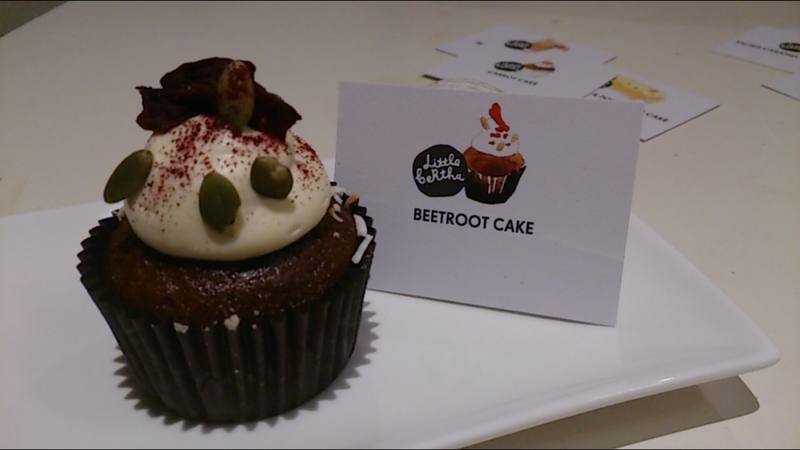 After some time to mingle with fellow bloggers of the world we gathered around the bench for an official welcome from the founders of Natvia – Mark and Sam – and then Sheryl (owner of Cupcake Central) showed us how to create a Not-So-Devilish-Chocolate Cupcake. For the recipe of this cupcake please refer to the bottom of the page. Sheryl walked us through the process of how they would create their cupcakes in store – they bake over 1000 cupcakes fresh every morning – as well as handing out some handy and useful tips throughout the whole process. Sheryl was really excited to be working with Natvia and the use of this sweetener at Cupcake Central – as she had many customers asking her if there were sugar free cupcakes available. Each of us also learnt how to put in the cupcake mixture into a cupcake papers in an easier manner – the trick is to use an ice-cream scoop (preferably a size 16). She also showed us a trick on an easy way to separate the cupcake papers when they come all bundled together – you have to slightly wet your index finger with a Chux towel, and using your thumb and your index finger separate the cupcake papers into the tray. Easy! Once we were through the making of the mixture and putting the mixture into cupcake papers – it was time to get them baked and learn how to use a piping bag and decorate our cupcakes! There were three different piping nozzles – Star Nozzle, French Tip Nozzle and the Wilton 1M Nozzle – to use, and fresh fruit (Strawberries, Banana, Bluberries and Raspberries) as well. It was a lot of fun to get to pipe out our own designs and top them however we wanted. Before leaving the event, we were given Natvia Goodie bags – which came with a box of Icing Mix, a box of Baking Pack, Cinnamon Splash Cluster Bars, as well as a premix from Cupcake Central for their Not-So-Devilish-Chocolate Cupcakes. Thanks Natvia for the invite to try out your new products and also to Cupcake Central for teaching us some tricks and tips about baking, icing and piping! I look forward to seeing what other great products Natvia produces as well as the different flavours of cupcakes that Cupcake Central can produce in the Sugar Free range. Decorate with Icing and ENJOY! Put into piping and you are ready to ice your cupcakes!